On their last road trip of the season, the Titans paid a visit to the West Nipissing Lynx. The same Lynx team that ended their 0-20 drought versus the Titans with an overtime win in Temiscaming. The Titans left Sturgeon Falls with a slim 4-3 victory. Erik Lilliecreutz scored the winner with only 67 seconds to play. Lynx goaltender Jacobsen could not stop the Titans 49 shot of the game. These same two teams could face each other in the opening round of the GMHL playoffs. 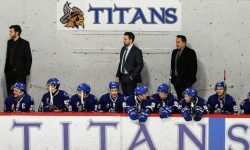 The Titans have only 2 games remaining, both in the friendly confines of the Centre as they finish off the season Friday night against their nemesis, the Ville Marie Pirates and then will close out the regular season on Saturday night against the Almaguin Spartans. Saturday night will be a special night “Dayton Murray night”. Emile Goulet was the winner. Other Titans goals came from Nikita Sidenko, Bailey Chenier and Dallas Routh. Axel Hallor and Dayton Murray each had 2 assists.